Loose-fill cellulose insulation is blown into your attic to raise insulation to the necessary levels for improved comfort and efficiency. Most attics have some form of insulation, but many homeowners don't realize how insufficient their insulation is. Fiberglass batt insulation falls well below recommended R-value for many homes, leading to home comfort and effiency problems. 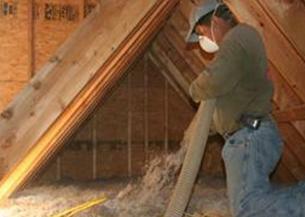 At Attic Systems, we use blown-in cellulose insulation to provide quality attic insulation solutions. Cellulose is a highly effective insulation material that will raise your R-value to the recommended levels and help you enjoy a more comfortable home while saving money. Call Attic Systems today to find out more and get an installation estimate! Effective: Cellulose insulation can have an R-value as high as R-4 per inch, making it a superior choice to traditional fiberglass batts. Installing cellulose after air sealing will eliminate energy problems in your attic and provide you with a more comfortable and efficient home. Fast installation: Blown-in cellulose can be installed over the top of existing insulation, meaning that there is no time-consuming and messy demo or material removal process. While we strongly recommend air sealing prior to insulation installation, most attics are ready for insulation as soon as any possessions stored in them are removed. Safe: Cellulose insulation is treated with a non-toxic borate solution that gives the material a Class-1 fire safety rating, which is the highest available. This separates cellulose from other, more flammable materials, giving you peace of mind. As an added benefit, the treatment also makes the insulation mold and pest resistant. Environmentally friendly: Cellulose insulation is made from recycled materials such as a newspaper, making it one of the most environmentally friendly options available. When combined with the improved energy efficiency you'll experience, cellulose is a great "green" home improvement choice. If you're tired of dealing with uncomfortable rooms in your home and expensive heating and cooling bills, attic insulation from Attic Systems is the solution that you need. Our quality cellulose insulation will eliminate energy problems in your attic, saving you money and making your home more comfortable. Call your local Attic Systems dealer today to get an estimate on cellulose insulation for your home!